Wairarapa writer Pat White has finished his six months as Writer in Residence at the Randell Cottage in Thorndon, Wellington, with a draft of a memoir and a stash of poems to show for it. For some of the time, White was also without his wife artist Catherine Day, although she came over from the Wairarapa to stay in the historic Thorndon cottage from time to time, and White popped back to pick olives and help out. White says he and his wife were both inspired by living in the cottage – he to write, and she to do her artwork based on rubbings of the floorboards which came from 19th century tall ships. They plan to publish a collaborative book of their Randell Cottage work. White said his time at Randell Cottage has been successful for a number of reasons. ‘I’ve been able to write a great deal. It’s enriched my dealings with another writing community. It’s opened up new possibilities in my poetry by being a new location.’ White enjoyed being close to libraries, archives, book and music shops, and the cultural life of Wellington. He also said the people who run Randell Cottage were warm and encouraging – he was involved in a number of writer events and made to feel welcome. That said, the Masterton farmer is looking forward to getting back home. 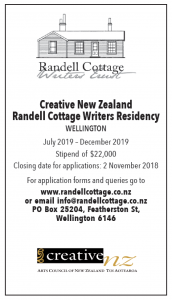 Before the Randell Cottage residency, he spent time at the Robert Lord Cottage in Dunedin, and before that was commuting over the hill to complete an MA at the International Institute of Modern Letters. He said it’s been tough on his wife, and he’s missed her and the routine of their life. The new Randell Cottage Writer in Residence is French writer Yann Apperry. The French stay for the summer in an arrangement which reciprocates the Mansfield Prize in Menton, France, while the NZ writer stays over winter. Due this week, 38-year-old Apperry will work on a novel. He writes in a number of genres: plays, screenplays, songs and librettis, and is interested in getting involved in Wellington literary and musical scenes. Apperry has won the literary awards the Prix Médicis and the Lycéens Goncourt.